The Ink Trap: Bellarific Friday at Stamping Bella: One layer cards! 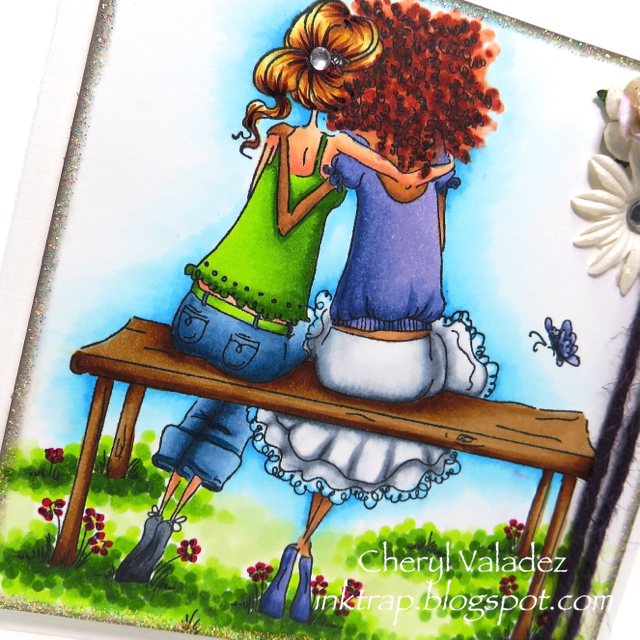 Bellarific Friday at Stamping Bella: One layer cards! Hey, all! Welcome back! Today is Bellarific Friday at Stamping Bella and we were tasked with a super hard challenge this week...create a one layer card! YIKES! Actually, I went into this with a plan. My strategy was to use a really large image that would primarily fill the card, then I wouldn't be tempted to fill the empty space with layers and embellishments. Simple, right? Yeah, right. I decided to use Uptown Girls Belinda and Bernadette-Bench Buddies, a large-ish image, that would take up most of my A2 card. I stamped the image, but noticed when ink hit the paper, it was a teeny bit askew. Oh, well, I knew I could straighten it up when I trimmed the panel down to fit my card base. No biggie. When it came time to start trimming, I miscalculated a skosh and when I finally got everything evened out, I was aghast to see that I was left with a minuscule 3 7/8 x 3 7/8" panel. Ouch! Worst part was, I couldn't fudge it by adding bigger layers of patterned paper. Nope! It's a one layer card, no wiggle room there! Anywhoo, my final card is 4 x 4". It's not even large enough to accommodate the sentiment that came with this lovely set. Sheesh. LOL! Visit the Stamping Bella Shop for LOTS more fabulous images and swing by the Blogabella to see all the wonderful single layer cards the lovely designers came up with. Wonderful friend image and lovely coloring on this one layer beauty! You managed to bring out a lot of depth with your spectacular coloring skills! You're funny :) I have done that too, stamped crooked and then think I can fix it and end up just trashing it and starting over. LOVE the way you did the grass and her hair - little blobs - love that!